DUSIT Thani Mactan Cebu could start its full operation in June this year. But for now, the five-star beachfront resort located on the northwestern tip of Mactan Island has opened 55 rooms out of the 272 total guest rooms. David Anthony Baldwin, the resort’s general manager, said the resort is almost done and that they are putting in the final touches of the property’s interiors, including the guest rooms. “With the construction progress, we are on track with the schedule,” he said. Dusit Thani Mactan Cebu is the first Dusit Thani resort in the Philippines. It is owned by Robinsons Land Corp. and managed by Thailand’s Dusit International. Since it soft-opened last week, Baldwin said the resort has gotten positive feedback from the tourism market led by locals. He said they log high occupancy during weekends and are now fully booked towards the upcoming Holy Week. “We are happy that the awareness (of the resort) is building,” he said. Aside from opening 55 rooms, the resort has opened two restaurants—Sea Breeze and Sunset Bar. Baldwin said a third restaurant, Benjarong Thai Restaurant, will also open in the coming months. Dusit Thani Mactan’s signature is the 100-meter-long infinity pool, which is complemented by the boardwalk promenade below. “Being the lone resort on the west side of Mactan, we enjoy magical Cebu sunsets on a daily basis,” said Baldwin. According to Baldwin, bringing in a Thai-branded hotel to the Philippines isn’t too difficult, as the culture of hospitality of both countries is somewhat complementary. “While the Filipinos are a bit outgoing and Thais are more reserved, they both complement each other well. There is warmth and grace,” he said. “Dusit Thani Mactan Cebu combines the best of Filipino and Thai hospitality and grace, and we look forward to contributing to Mactan’s hospitality landscape,” he added. To make the travel experience in Cebu easy and convenient, Baldwin also announced that they are outsourcing an exclusive water transfer service that will ferry guests from the airport to the resort and vice versa. “We are building our dock so we may offer water transfers for arriving and departing guests. The Marina is just a short ride from the airport, where guests will board a catamaran for a lovely ride to Dusit Thani Mactan Cebu,” he said. According to Baldwin, this is their own solution for guests who want to make the most out of their vacation time. “This is a great way to begin their resort holiday,” he said, noting that this will also spare guests from the land transfers from the airport to the resort that are mostly interrupted by traffic congestion. Dusit Thani Mactan Cebu is 11 kilometers from the Mactan-Cebu International Airport. Baldwin said that by taking the small vessel, it will only take guests some 20 to 30 minutes’ ride to the resort. 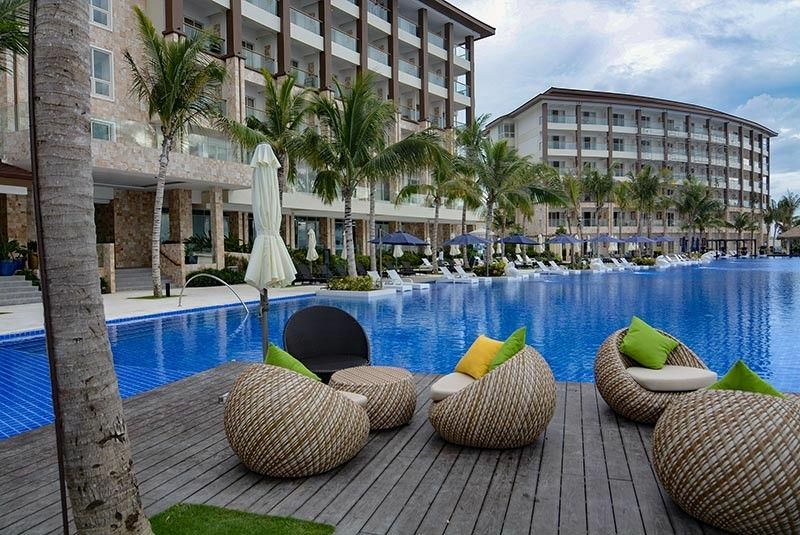 Aside from being known as a leisure destination, Dusit Thani Mactan also hopes to attract the meetings, incentives, conventions and exhibitions (Mice) market. Baldwin said the resort boasts of six event venues, the largest of these is the 1,235-square-meter Dusit Ballroom, which can seat 600 guests for banquets or up to 1,000 guests for cocktails. It also has an outdoor setting named Sky Garden with the same capacity of the ballroom that can be an avenue for team building sessions, outdoor event receptions and health and fitness-related activities. Other amenities of the resort include the TechnoGym that is equipped with D-FiT Fitness Center and a variety of water sports and activities, Namm Spa for relaxation, a dive center, and a 500-square-meter fun zone for the children. “As the market matures in sophistication and as competition continues to increase, introducing a global brand will further fortify our presence in Cebu,” said Arthur Gindap, senior vice president and business unit general manager of Robinsons Hotels and Resorts. Dusit Thani Mactan is the centerpiece attraction of the 10-hectare AmiSa mixed-use complex.